The Smart Fitness Mi Band 3rd Edition has been launched in India, and it would be exclusively sold on Amazon India. Xiaomi Mi Band 3 price in China is CNY 169, which comes roughly to ₹1800 in Indian Rupees. However there is also a higher variant of Mi Band 3 which comes with NFC feature which is priced in China at CNY 199, which comes roughly to ₹2100 in Indian Rupees. The launch event of Mi Band 3 Smart Watch was been held on 27th September 2018 in Bangalore. 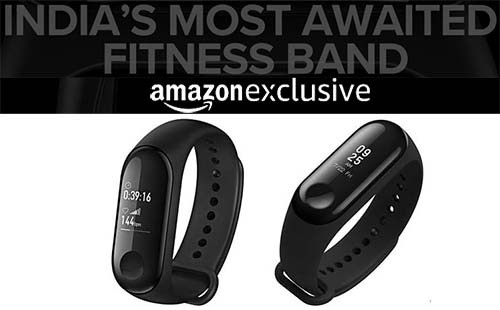 Amazon has also made landing page of Mi Band 3 live on its ecommerce portal hinting its new features like Track More in Real Time, See more with a bigger display, and do more on a single charge. Mi Band 3 is priced in India at ₹1,999, and you can buy it online from Mi Official Store or from Amazon India who is exclusive selling partner of Mi Band 3. If you are using Mi Band 1 or Mi Band 2 then why you should upgrade to Mi Band 3?, or if you are new or not an existing user of Mi Band product then why you should buy this Mi Band 3? You could decide by referring to specifications of Mi Band 3. Mi Band 3 Fitness Tracker has grabbed the attention of fitness freaks by setting up best price for the product, as well as the look of Mi Band 3 has been improved as compared to Mi Band 2. If you go to buy Fitness Band with similar features of rival brands, then its cost would be significantly high. Also Mi Band 3 looks and feels very premium as compared to other brand fitness band available in market.